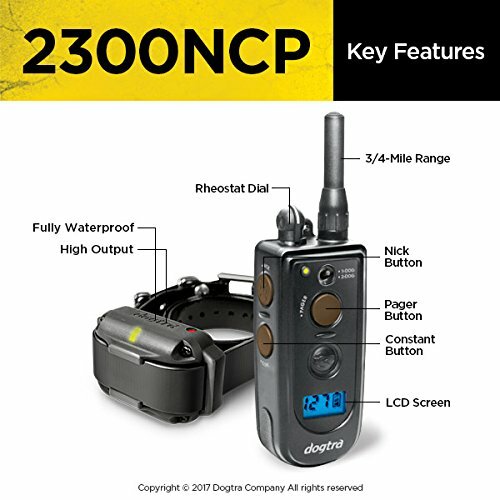 The Dogtra 2300NCP Advance with LCD Screen is a true multipuropse e-collar for mild mannered or stubborn dogs. 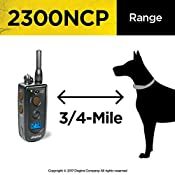 It is designed for advanced level pet training, competition field work or any type of hunting where a 3/4-mile range is needed. Uses a 2-hour rapid charge Lithium Polymer battery. The LCD Screen accurately displays the exact level of stimulation along with a battery life indicator. The "Constant" stimulation gives you plenty of guidance or correcting power and the "Nick" is mild but motivating. The "Pager" button is non-stimulating pager/vibration feature. 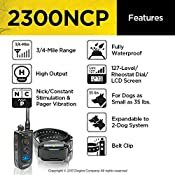 The dial on the transmitter allows you to change the level of the collar even as you are working the dog. The LCD screen displays the exact level your collar is set to. 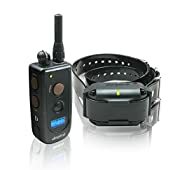 This will make it easier to adjust the intensity level and to know what your collar is set to and how much you are increasing or decreasing the setting. 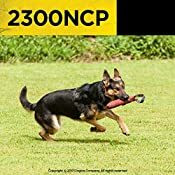 The blue LCD screen on the Dogtra 2300NCP is perfect for low light or dim areas. There is a three-bar battery life indicator on the transmitter that indicates the battery life left for your collar/receiver.